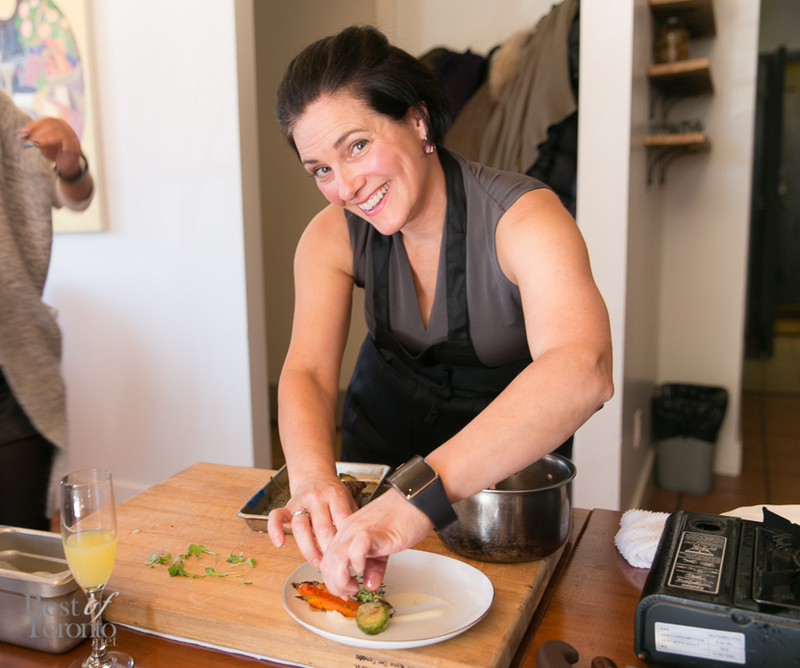 We were divided into teams of four and warmly greeted by Chef Harding as well as representatives from Samsung Canada. Chef Harding talked about how he’s already been putting the Gear S through it’s paces while working in the Campagnolo kitchen. He talked about how useful the Gear S is when his hands aren’t readily available to check phone notifications or take calls from his staff. You can take calls and have conversations completely from the Gear S without having to pull out your phone. The Gear S is also dust and water resistant – how water resistant? Like its predecessors, it has a dust and waterproof chassis, with a rating of IP67. Samsung reps told us this means you can safely shower with it and even submerge it in water for a short period of time. And obviously cook with it. “@SamsungMobileCA: . @Campagnolo_ preps pasta with Water and Dust Resistant #GearS on his wrist. pic.twitter.com/Ntg1Fr8Igt”what a fun day! 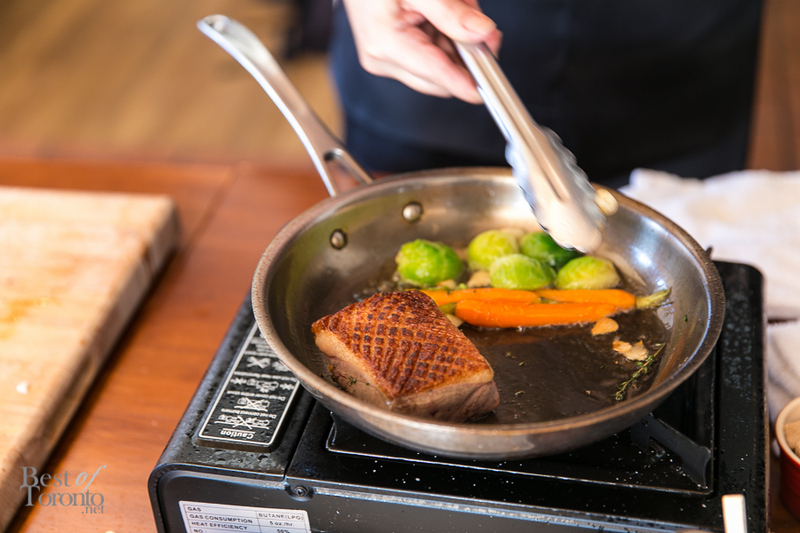 So Chef Harding went through the steps to teach us how to make pan seared duck breast with fresh herbs and vegetables. I’m developing a huge appreciation for herbs in cooking lately and Harding says he loves using thyme, so he used it here with us in this session. He said he also swears by the Vitamix food processor and we used it to make a beautiful, creamy cauliflower puree. Our final result… beautifully done, Theresa and team! It was also delicious with the crispy duck skin – our team devoured it quickly. Our team’s final plating of the pan seared duck breast with cauliflower puree. 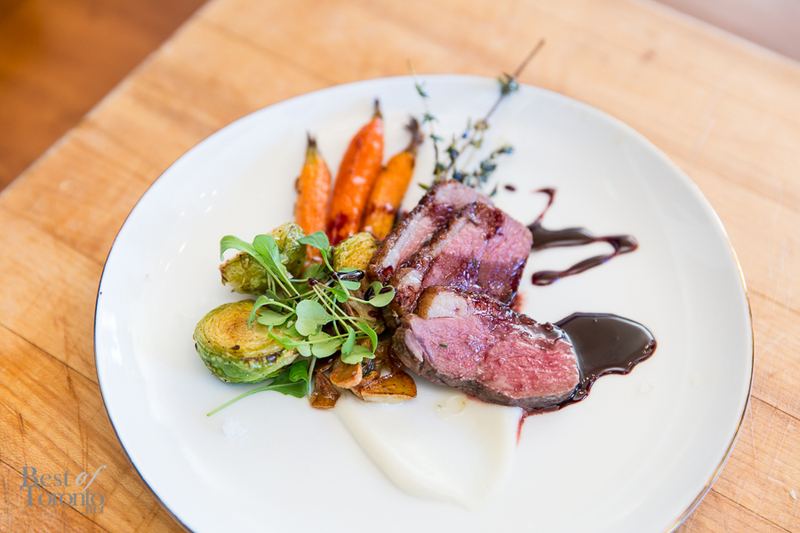 Complete with our own twist of red wine reduction sauce for lactose-intolerant team members. During the cooking session we were getting instant notifications and live pictures on our Gear S devices. Pretty great for busy people who must multi-task. 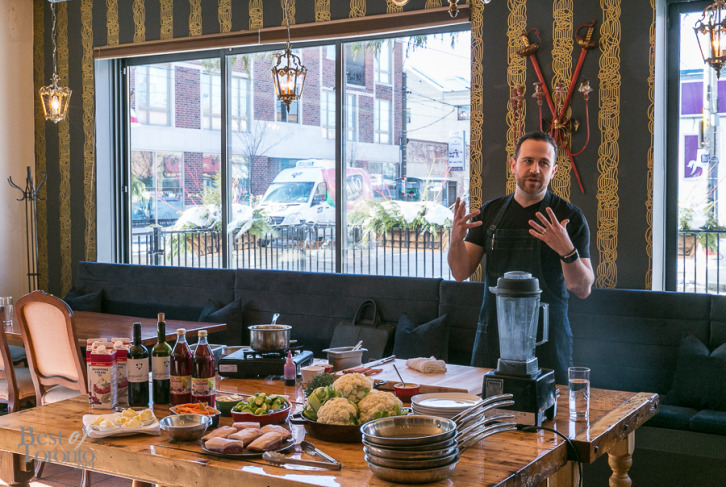 While I’ve never been to Campagnolo before, it was easy to see how much Craig enjoyed cooking and he was very friendly and approachable while showing us his talents. This humble Italian resto on Dundas West has racked up a few accolades including enRoute’s list of Canada’s Best New Restaurants in 2011. Craig Harding’s partner is HGTV’s Alexandra Hutchison. If I had time I would tell you for lengths and never-ending details about how much I love this new highly-anticipated Samsung device. It’s pretty much going to be the Samsung flagship phone/phablet until the even more highly-anticipated Samsung Galaxy S6 comes out. So I’ll be brief and just talk about the new Edge. It’s all about the Edge – this beautiful rounded edge screen feels great on the thumb with the smooth curved glass. It is quite customizable and completely independent from your main OLED screen, giving you new found flexibility that you didn’t know you needed. The more you try this, the more you appreciate the Edge. So let’s say while you’re watching a video you can see notifications and even scroll through multiple Edge windows. It including shortcuts, weather, and even a mini memory game completely playable from the edge screen. The Edge really gives the next generation of superphones … an edge over the competition. Sorry for the pun but it’s true. 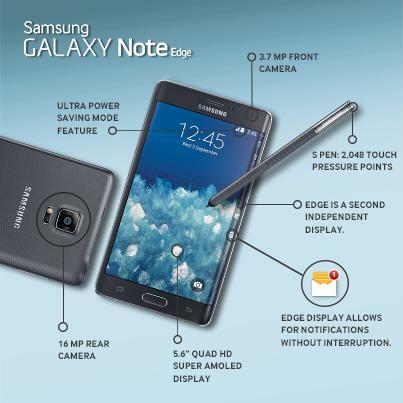 To learn more about the Samsung Galaxy Note Edge click here. Inactivity alert – Vibrating every hour you are inactive – it often told me I had been inactive for two hours! 3G and wifi connectivity – new to the Gear S is a SIM card slot. So your wrist can potentially have it’s own standalone phone number and data connection and GPS. It can also connect directly to wifi networks. In a real life scenario I was playing an action game on the Samsung Galaxy Note Edge and then I get alerted about a phone call on the Gear S paired over Bluetooth. I didn’t (or couldn’t?) want to stop the game so I was able to answer the call and have the conversation from my wrist while still playing the game. A surprising convenience! 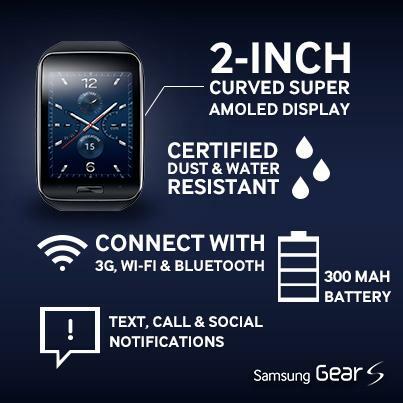 To learn more about the Samsung Gear S click here. After spending a week with this power couple, I am in love! The Galaxy Note Edge is a bit big for my tastes but it is making me really crave the Edge on the smaller upcoming S6 Edge (news reports everywhere back up these rumours). I can’t wait! Campagnolo’s Chef Craig Harding discusses his experience with the Samsung Gear S.
The winning team got the Samsung Gear Circle, new bluetooth earphones. Lucky!